It’s very sobering for me to write this post, as we are all still pretty shaken up about the whole thing. What happened this week was certainly not on the agenda for Mom’s Big Year nor on my ‘to-do’ list for this week, that’s for sure. I’m a mom. And many of you know, a very thankful one, often counting my blessings. Now, I’m more thankful than ever. This week, I was given the gift of clarity, through an experience that reminded me of the fragility of life and of what really matters. It happened in Howard County, Maryland Tuesday afternoon around 1:40pm and the National Weather Service later confirmed that the 500 yard path traveled right through my yard. See map below. 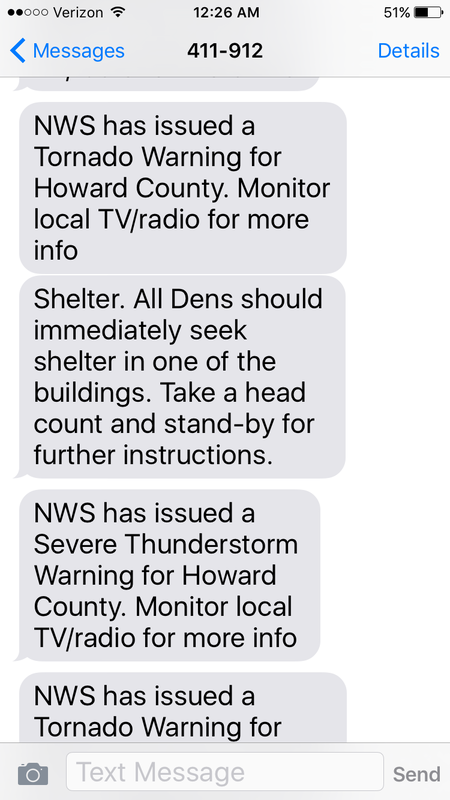 I was alerted to pick up my son from the nearby cub scout day camp early due to the impeding severe storms.. but we had NO idea what was in store for us. I saw a deep dark curtain of charcoal blue hanging in the sky over the camp as I approached and my ‘mother bear’ instinct kicked in. At that moment, I KNEW I had to get to my 10 year old son. Like now. My view as I approached camp at 1:35pm. 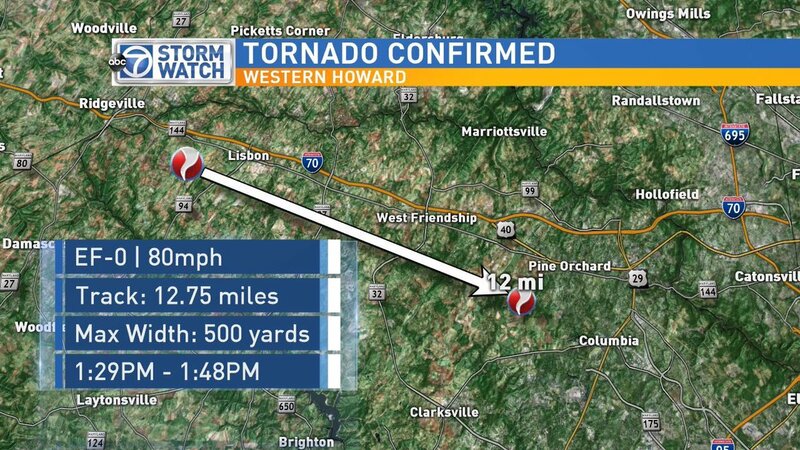 I had no idea at that time, the tornado had already touched down and was heading in this direction. When I arrived in the parking area and raced out of my car, my feet slipped in the wet grass as I rushed from the vehicle. Once I got up some speed and bolted toward the camp building, I was stopped dead in my tracks by the shouts of a camp official instructing me to ‘shelter in place’ in my car IMMEDIATELY. Our cars were parked about a 5 minute walk away from the campers. But at that moment, I knew .. no matter what..I needed to get to my son. If we were going to ‘shelter in place’ to brace for a tornado, he and I were going to do it together. Now those of you who know me, know I’m a rule-follower. But at this moment, rules meant nothing to me. Against the direction of the staff, I drove right up to that building and ran through the barricade of administration monitoring the doorway. The power was out, and I searched for my son in the sea of 900 children sitting orderly yet scared in the warehouse-type building. Using my ‘mother bear’ superpowers, I navigated that huge, dark building, spotted my son, and within seconds was holding him in my arms, squeezing him so tight he squealed. Scared, yet so very relieved to be in my arms, he sobbed. I would have cried too, but I was pumped full of adrenaline. As the storm blew harder, I knew I had to make some quick decisions about what to do next. The usual 7-minute drive home to my daughter took 2 hours due to flooding and trees and wires down. The roads were not even closed by police yet.. It all had just happened and looked like a war zone. trees hanging on wires over nearby roads, unreal! The damage to our property is surreal.. The destruction is very localized and it’s truly amazing no one was injured or killed. Fortunately, our house is intact with some water damage in the basement. We have approximately 20, 150 foot trees that were sheared off or knocked down by the 80 mph winds. These two photos below were taken in our backyard almost exactly 24 hours apart Monday-Tuesday of this week. Here’s a photo tour of the damage in our yard. lots of great memories here! Seeing the extent of the damage, we are counting our blessings. Every. Single. One. I am so impressed and deeply indebted to the cub scout camp administrative staff for handing the whole situation so professionally; to my son’s exceptional den leaders this week, James & Alice Johnson, who treated the boys as their own, especially in such a scary situation: to the countless neighbors, friends and strangers, who have offered their assistance, support, calls and messages of encouragement and prayers; to those strangers-turned-friends who have hugged me on the side of the road; to my kids and hubby for being so brave and strong through this whole ordeal; as well as to our community leaders and local emergency management officials for navigating our county through this extreme weather event and its aftermath. Everyone has worked together throughout this entire situation to keep each other safe and lift each other’s spirits. My heart is full. After dropping my little guy off at scout camp this morning, I’ll admit, I finally had a good cry. The adrenaline rush is over, and the reality of the massive scale of the clean up is starting to hit hard. However, I just recalled the morning after it all happened. The beams of the sunrise radiated through my window, prying my eyelids open. I kicked off the covers and jumped out of bed. As I peeked up out the window at the beautiful light filtering through the forest in front of me, my heart sank as I looked down out at the devastation surrounding me. I gasped as I recalled the life changing events that I had somehow temporarily forgotten from the day before. I cracked open the window to catch a sense of the morning air and to soak in this new and strange world around me. As I did, the “teacher-teacher-teacher” song of the Ovenbird rang out loud and clear nearby in the debris. The ‘”peet-zah!” call of the Acadian Flycatcher followed. And then I heard the melodic & beautiful “ee-o-lay” song of the Wood Thrush. It was the same exact repertoire as the morning before this had all happened.